And how does Malik’s dual nationality hurt you? 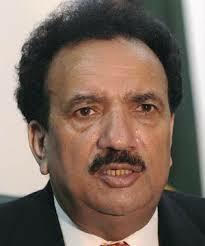 The Sindh High Court (SHC) on Tuesday questioned the entitlement of the civil rights campaigner to file a petition challenging verdict of a sessions court that acquitted former interior minister Rehman Malik in a dual nationality case. A single bench of SHC headed by Justice Abdul Rasool Memon was seized with petition of Syed Mehmood Akhtar Naqvi, a civil rights campaigner, who requested the court to set aside the sessions court verdict as it was based on erroneous facts. When the petition came up for hearing on Tuesday, the judge asked the petitioner to satisfy him as to how he was an aggrieved party in the case which was instituted by Election Commission of Pakistan (ECP). Hearing of case was adjourned till September 15. Following the directives of Supreme Court, ECP had filed complaint against Rehman Malik in 2012 for filing false declarations along with his nomination papers for elections in an attempt to conceal his dual nationality. District and sessions court in Karachi had announced a verdict on September 4 whereby it acquitted Malik in the dual nationality case.